This yellow-rumped warbler, or “yellow rump,” is busily gobbling waxy white poison ivy berries, fueling up during the fall migration. Both males and females have a bright yellow patch on the rump year-round, and some yellow on their sides. They are relatively large for warblers – about the size of chickadees. Yellow rumps in eastern North America are also known as “myrtle warblers” for their fondness for eating waxy bayberries (in the waxmyrtle family) and wintering on Cape Cod. Fall travelers through Westborough are feasting on poison ivy. They’re not human travelers, of course, but yellow-rumped warblers (Dendroica coronata), also known simply as “yellow rumps.” These insect-eating songbirds add fruit to their diet in fall and winter as the seasonal supply of insects grows small. Poison ivy berries are one of their favorite fruits. Poison ivy berries? Most of us are so busy avoiding poison ivy (Toxicodendron radicans, Rhus radicans) during the growing season – “three leaves – let it be” – that we don’t notice its small greenish white blossoms. Like other wildflowers, these blossoms get pollinated, typically by small bees and flies, and develop into small waxy white fruits that ripen in the fall. Now, in late October and early November, we’re apt to overlook the dull white poison ivy berries in our rush to admire or even collect branches with brilliant red native winterberries (Ilex verticillata) or vines of invasive oriental bittersweet (Celastrus orbiculatus) with decorative orange-wrapped red berries. To find yellow rumps at this time of year, look for poison ivy. Thick, hairy poison ivy vines climb high into treetops, and smaller vines and plants grow over underbrush or across the ground, bearing clusters of white berries. Yellow rumps may come down to eye level to feast. Or they’ll flit about in the treetops, snatching a few remaining insects from the air and plucking poison ivy berries from the vines. Check for poison ivy and these birds at the Westboro Wildlife Management Area. Walk the old paved road that leads down the hill from the Fish and Wildlife headquarters, near the pines. Go on Sundays, when hunting is not allowed. A few weeks ago, poison ivy was easy to pick out in the landscape. The vines announce their presence with a blaze of red foliage, contributing to the fall scenery, adding to reds from sugar maples, red maples, Virginia creeper, sumac, sassafras, and blueberry. If you remember where you’ve seen poison ivy’s display, you’ll know where to look for yellow rumps now that the leaves are down. Poison ivy’s display is no accident. The berries may not be eye-catching, but the red foliage is. It advertises the ripening of its fruit to birds that eat it, such as migrating yellow rumps. The birds spread its seeds as they pass unharmed through the birds’ digestive tracts and land in new locations, along with droppings that serve as fertilizer. Yellow rumps are not alone in enjoying the fruits of poison ivy. At least 60 different birds eat it, including northern flickers and downy woodpeckers, ring-necked pheasants, and ruffed grouse. How can yellow rumps eat poison ivy? Clearly they are not bothered by poison ivy, which provokes an itchy, blistering rash in people who are allergic to a chemical called urushiol in its sap. About 75-85 percent of us are allergic to it. People who think they don’t “get” poison ivy still have to be careful, because the immune system reaction that causes the rash typically develops only after the first exposure to poison ivy. The reaction often gets stronger with each exposure. But the immune systems of yellow rumps and other birds (and rabbits) are different enough from ours that these animals don’t suffer the same reaction. Yellow rumps can also eat poison ivy berries because they are good at digesting wax, a food that’s especially hard to digest. Thanks to this neat digestive trick, yellow rumps – as well as tree swallows (Tachycineta albilinea) – can eat loads of waxy bayberries (from northern bayberry, Myrica pensylvanica), which early New England colonists used to boil down to get wax for candles. 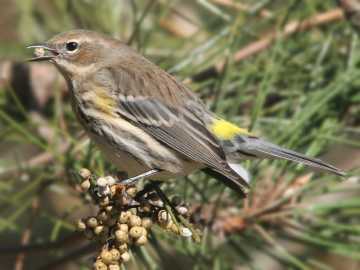 Yellow rumps in eastern North America are known as “myrtle warblers” because of their taste for bayberries and other fruit in the waxmyrtle family. Thousands of yellow rumps also make a habit of wintering on Cape Cod where bayberry is plentiful, instead of flying farther south. So how can they eat wax? Over countless generations, their digestive systems have become specialized for doing so. Yellow rumps can get a whopping 80 percent of the energy out of bayberry wax. Fats, including waxes, move slowly through their digestive tracts, allowing plenty of time for digestion. And while yellow rumps can’t exactly chew their cud the way cows and deer do, they do something similar. These birds can return partly digested food to earlier portions of their digestive tract for more processing. They also produce extra bile salts, which help to digest fats and wax. Yellow rumps are abundant and widespread in the U.S., but our eastern yellow rumps – the ones known as myrtle warblers – look somewhat different from yellow rumps in the western U.S., which are also called Audubon’s warblers. In the past, myrtle warblers and Audubon’s warblers were considered separate species. But they’re genetically very similar, and it turns out that they interbreed. This happens in areas where the two meet, namely the mountain passes of the Canadian Rockies. Because of this interbreeding, they’re all now lumped together as yellow-rumped warblers. The story, or rather, the history behind the two groups of yellow rumps is a long, slow one going back to the ice ages. Advancing glaciers 80,000-21,000 years ago apparently divided the ancestors of today’s yellow rumps into two groups and kept them separate long enough for the two to develop somewhat different feather color patterns. Then, when the glaciers retreated and forests grew back, spreading northward, the two groups came back into contact about 7,500 years ago. In spite of differences in appearance, birds in the two groups recognized one another as potential mates and began to interbreed. But back to the present. If you don’t glimpse a yellow rump this fall, your next opportunity will come next spring, from mid-April through May. That’s when yellow rumps head north to nest in the insect-filled spruce forests of northern New England, western Massachusetts, and Canada. They’ll clear out of Cape Cod and come up from southern states. They’ll be in bright breeding plumage, still sporting yellow rumps and sides but also with yellow crown patches on their heads. But there’ll be no tempting poison ivy berries to help us find them!